Editors: Daniel R. Langton and Renate Smithuis. Download the complete volume for free (5.4 MB, pdf). Buy the printed edition ISBN 978-1-4632-0240-8. Lily Montagu was the founder of Liberal Judaism in England. Because of Montagu’s groundbreaking proto-feminist efforts women in Liberal Judaism can become rabbis, be called up to read the Torah, they are equal in divorce law, they can study the sacred texts, they can form a minyan, and can assume communal and religious positions of authority over men. Montagu was an author, theologian, and social worker; she was the driving force behind the development of Liberal Judaism. However, this biographical overview does not match up with the extant historiography that has instead preferred to focus on the male leaders of the Liberal movement to the extent that Montagu’s intellectual and theological contribution has been marginalized and even completely ignored. In this paper we will see through analysis of rarely seen literary material another aspect of the gendered history of fin-de- siècle Anglo-Jewry that would otherwise be forgotten; even more, we will see in Montagu’s essays, monographs, and novels some of the English foundations of contemporary Jewish feminist theology. In the process, the biography and memory of Lily Montagu will be restored to its rightful place. The fate of Jewish communities in the western Diaspora in the period between the collapse of the Roman Empire in the fifth century and the efflorescence of Jewish learning and culture in ninth-century Spain and tenth-century France and Germany has been neglected by both Jewish and generalist historians. It has been assumed that late antique communities outside ancient centres like the city of Rome and the south of Italy were relatively recent and the period saw a contraction and withdrawal of Jewish communities to the Mediterranean littoral until they were revitalised by Jews from the Islamic south and east. More recently it has been suggested that western Jews were cut off from Hebrew language and Halakhah and therefore developed as purely ‘biblical’ Jews, an easy prey to Christian proselytism. However, the late antique and early medieval periods have recently been reassessed and are now seen as a period of continuity. There is evidence that Jewish communities were more extensive and longer established than previously assumed, and that Jews in the west continued to maintain a vital contact with the east and had access to Hebrew learning, Hebrew scrolls and oral tradition. The identification of a previously unknown Latin Jewish manuscript (the Letter of Annas to Seneca) and the discovery of Jewish settlements in Roman Gaul suggest that evidence from this period has been neglected or overlooked and that the period needs reassessment as a period that provided the demographic and cultural continuity that the later medieval community built upon; an indigenous Latin-speaking ‘Romaniote’ community that underlay the later communities of Sepharad, Tzarfat and Ashkenaz. 3. Bernard S. Jackson, Why the name New TESTAMENT? Both theology and philology suggest that the title of the Christian scriptures should have been “The New Covenant” rather than “The New Testament”.1 Why then did the Church Fathers from at least Tertullian in the 2nd century adopt novum testamentum? Was it simply a confusion of the LXX (covenant) and koine (a will) meanings of diathēkē (διαθηκη)? I first review the translation history and the methodological issues it raises (section 1) and then turn to two very different theological approaches to the question (section 2): I reject the attempt of Behm to impose (a version of) the koine meaning (in his view, as a unilateral disposition) on the LXX (and subsequent literature, and even extending back to berit in the Hebrew Bible) as both theologically and legally inappropriate. Far preferable is the more recent account of Schenker, who sees the use of diatithēmi and diathēkē in reference to meta tēn teleutēn transactions as having been chosen as appropriate to the terms of God’s covenant regarding the land and its use, and rightly shows the range of succession institutions to which this terminology could be applied. Both Behm and Schenker need to take positions on the forms of succession in vogue at the relevant periods (LXX and NT) in the Hellenistic and Jewish worlds. In section 3, I summarise the current state of knowledge and debate in legal historical studies, stressing the danger of assuming the features of modern “wills”, and noting the close relationship to political alliance (cf. covenant) in the “will” of the 2nd cent. BCE Ptolemy Neoteros of Cyrene. More generally, I argue that there is a connection between covenant and inheritance in the Hebrew Bible, including (but not restricted to) “spiritual inheritance” (section 4); that this was sharpened in the “Testament” genre of 2nd commonwealth (pseudepigraphical) literature, developing a model found already in the Hebrew Bible (section 5); that two New Testament texts explicitly associate covenant and (by analogy) testament (section 6); and finally that some aspects of the Roman testamentum (even more than the Jewish and Hellenistic forms of will) may well have proved theologically appealing to Tertullian, resulting in his adoption of the terminology of testamentum vetus and novum (section 7). In particular, the Roman testamentum took effect in its entirety only on death and automatically revoked any earlier will. The article offers an overview of the corpus of poetic disputes between the months com- posed in Aramaic, together with a critical edition of one such poem, איתחברו ירחי שתא by Sahlan ben Avraham (Fustat, 11th century). The critical edition is accompanied by translations of the poem into Hebrew and English. Part of the text given in the critical edition is based on a copy found in a Genizah document copied in the 13th century by Yedutun Ha-Levi, now known as סדר פוסטאט א. The history of publication of this document is reviewed, and a description of its remaining fragments (including a new fragment identified as part of the present edition) is given. 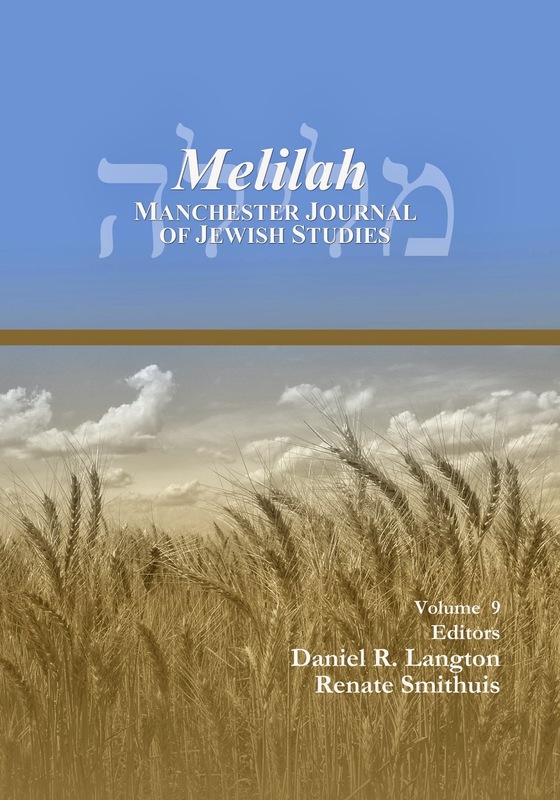 Melilah is an interdisciplinary Open Access journal concerned with Jewish law, history, literature, religion, culture and thought in the ancient, medieval and modern eras. 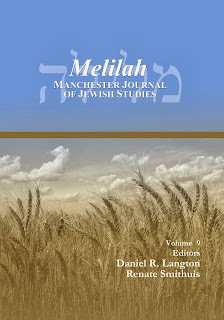 Melilah is published electronically by the Centre for Jewish Studies at the University of Manchester (ISSN 1759-1953), and as a printed edition by Gorgias Press. Melilah is licensed under a Creative Commons Attribution 3.0 Unported License. Indexed by ATLA Religion Database® (ATLA RDB®), Ebsco (Humanities Abstracts, Humanities Index, EBSCO Current Abstracts, EBSCO Current Citations Express, Index to Jewish Periodicals), ProQuest (ProQuest Research Library, ProQuest Curriculum Essentials, ProQuest Religion), Religious & Theological Abstracts, Rambi. If you wish to be informed when a new volume of Melilah appears, please subscribe (for free) for an email announcement.